what First Baptist Church is all about. The cross is the central focus of the logo. It is what your eye is drawn to first. Above all else is the empty cross, signifying the death and resurrection of Jesus Christ for our sins. This is our message and motivation for all that we do. He is our passion and our hearts are full of praise and thanksgiving to Him. Jesus is the reason for all we are and do. The figures are joined together before the cross. We believe that unity and harmony is a core ingredient of Christ’s Church. We strive to be of one heart, one mind, and one purpose and are to go through this journey together as one in Christ. The figures have no distinctions in color, size, etc. We believe the church is for all people, of all races, color, backgrounds, and culture. The figures are looking to the cross. Our relationship with Christ is what brings us together, and keeps us together, as a church family. The arms reaching out represent our intent to always be reaching out to the people in our community & to the ends of the earth with the message of Christ’s love & life. 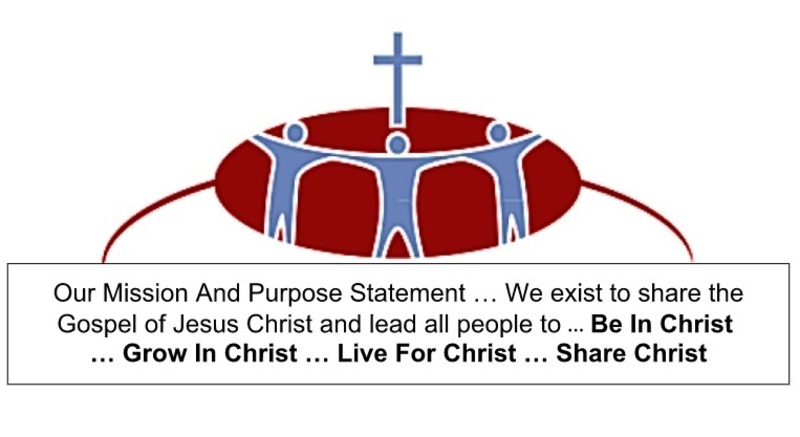 The caption below the Logo states our mission and purpose as a church – To share the Gospel of Jesus Christ and lead all people to Be in Christ … Grow in Christ … Live for Christ … and Share Christ.